As I have said many times, taste is totally subjective. Although taste maybe a huge factor on how I grade my food adventures, but I think past experiences and expectations also plays a big part. 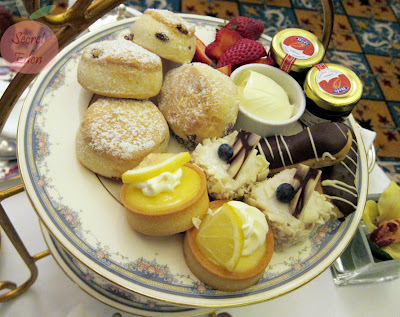 I guess this would be the case with this particular afternoon tea at the Fairmont Hotel Vancouver, because I expected to be at par with other Fairmont afternoon teas. Once again it was another online deal (Dealfind) that lead me here. Just like the last one from Fairmont Pacific Rim, this was also a 2 for 1 deal ($36/2 ppl). I know this has nothing to do with food, but this deal actually sold more than 10,000+ vouchers, comparing to the 2000+ vouchers from the previous deal. I am not sure if it was intentional or someone just dropped the ball and never capped the deal. On top of that, this deal is NOT valid on Sundays. So that means it's only valid one day on the weekend. I am not sure about you, but I for one works during the week days, as I would assume most people do. So if you bought this deal, you better reserve soon, because I hear the wait time is about 2 month now. Anyways enough with my ranting and let's move on to the food. I have just been to the afternoon tea at the Fairmont Pacific Rim a couple of month ago, so the memories are still fresh in my mind. Therefore it's only natural that I drew comparison between the 2. 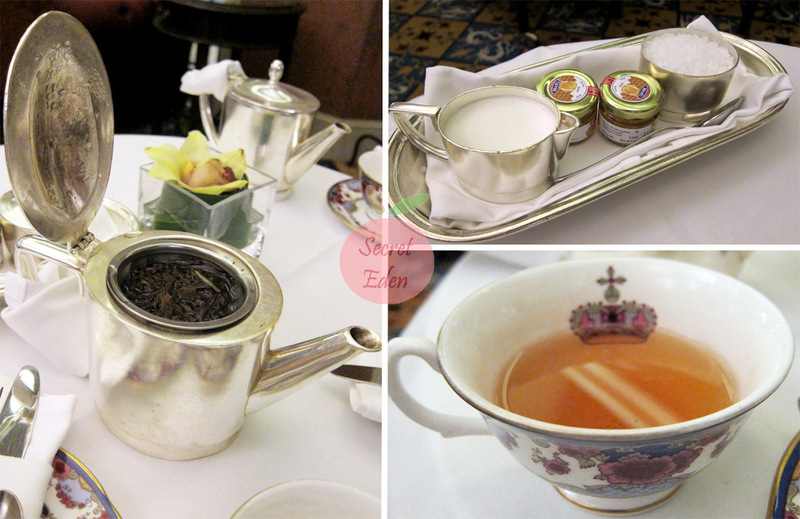 First, I loved the tea cups here, it was more traditional. Second, I love how they didn't only provided the sugar and cream, they also provided a small jar of honey as well. For my tea, I went with the ice wine tea(a delicious fresh and piquant white grape flavor with hints of exotic fruit that pleasantly lingers on the tongue). The tea had a fragrant grape aroma with a slight grape taste. It was really refreshing and tasted even better with honey. I highly recommend this tea. Although my tea was delicious, but I would have preferred to see and smell it first like the Tea Box presentation seen at the Fairmont Pacific Rim. Since these tea pots are actually made of metal including the handles, they are really hot to the touch. Remember my little rant above, well because they had too many people that day (not surprised), they can only offer us napkin as handle cover instead of the real ones. These fell off really easily, and I did get slightly burnt once. The food came after about 15 minutes after the tea. I loved the traditional two-tiered serving tray. Usually there are 4 desserts, but here they only had 3 plus the scones. There were 4 savory sandwiches, which is comparable with other places, but Fairmont pacific rim had 6 savory treats (2 sandwiches and 4 'sushi'). Lemon tart: Although the shortbread like crust was good, but the lemon custard was too sour for me. Eclair: This was quite sweet, due to the milk chocolate cream filling. Special cheesecake: I love cheesecake, but this was the biggest disappointment. It was way too sweet, and didn't really have any cream cheese taste to it. Also the white chocolate shaving outside was a bit overkill since it was already so sweet. Overall, I think the scones are too die for, but the rest was a bust. Croissant with ham & brie: The croissant was buttery and flaky and the brie just enhanced the flavor of the sandwich. They also spread some mustard in this which I was not a fan of (personal preference). Cucumber & watercress: I didn't like this, as it was rather bland. Also, I found the bread to be stale. Curry chicken on baguette: Although the curry chicken was good, but the bread was soggy. Maybe because we ate this near the end. All in all, both R and I found the savory treats to be on the weak side, and we both much prefer the ones we had at Fairmont Pacific Rim. The tables and chairs here all looked like miss matched antiques, but it works. This place certainly did have that British flare. However the only problem I had was with the lighting. It was rather dark because there weren't any natural lights at all. Service was not bad, some were more friendly than others. Our waiter never bothered to explain what each piece was like some others were doing. I actually enjoyed my afternoon tea at west lounge, i found it tasted better than all others tea places in Vancouver. again, taste is subjective. One thing I agree is that the scones are die for.